Automotive Switch Market size was valued at over USD 25 billion in 2016, with the global shipments growing at around 5% CAGR estimation from 2017 to 2024. Growing consumer preference for integrated electronics inside the vehicle owing to the convenience and improved safety will drive the automotive switch market size. Increasing automobile demand globally will augment shipments in the coming years. The automobile production has increased by 13% from 2012 to 2016 globally. Vehicles manufactured currently include a complex combination of integrated mechanical structures and intelligent electronic systems. Switches are an integral part of electronic systems, and help in the overall functionality of the vehicle. Modern automobiles are equipped with numerous electronic systems such as HVAC, infotainment, window, heated seats, electric steering, acceleration, transmission, and headlight controls. Technological advancements in automotive electronics have resulted in improving the user connectivity and increasing the efficiency of the vehicle, this will prove favorable for the automotive switch market. It does not require high degree of human intervention as they respond to electric signals automatically and benefit the drivers in managing the systems without getting preoccupied. With innovation, the designs have grown from the single on-off function units to a combination that can be used for cruise control and turn signals, wipers, and lights. Touchpad automotive switch market size will grow considerably over the forecast timeline. Increasing adoption of touchscreen panels by OEMs has raised the demand for feedback touch controls. Adding smartphone functionality to vehicles will also result in a significant growth of touch panels and touchpads over the forecast timeline. These are easier to maintain and integrate, and can be updated and managed remotely using software. They have minimum moving parts which reduces the chance of breakage. Improved aesthetics provided by touch panels reduces the clutter of a cockpit and can display rich media. These benefits have eroded the automotive switch market share for knobs, buttons & levers. The touchpad’s feedback requires the driver to take his/her eyes off the road, impacting the security of the passengers. Knobs, levers, and buttons have tactile feedback, which can be operated without looking at them. Integration has eliminated the physical buttons and knobs for improving aesthetics and providing better infotainment. Concept cars, such as BMW I Vision Future Interaction, VW T-Cross Breeze, and Acura Precision, have eliminated the usage of buttons and knobs and have touchscreens providing all the information. Similarly, Tesla models have two screens oriented into landscape and portrait mode to provide autonomous or semi-autonomous driving information. Engine management switches are expected to continue their dominance over the forecast period. Increased automobile safety during driving will favor advanced EMS automotive switch market size. These have an important role in monitoring the engine operation and improving the vehicle efficiency. Fuel pump cut-off, anti-lock pressure, neutral safety, traction control, parking brake, cruise control brake, and clutch release are some of the components installed for the safety of drivers and passengers. Engine coolant temperature, front axle engagement, starter relay, and clutches are chief components enabling the driving operation of vehicles. Products used for these purposes are coupled with various sensors monitoring the activation/deactivation based on requirements. Passenger vehicles accounted for over 70% of the automotive switch market volume in 2016. Benefits such as enhanced user driving experience, added safety features, and better engine operation, have supported the passenger segment growth. The penetration of touch panels and touchpads is less in commercial vehicles in Asia Pacific as compared to North America. Countries such as the U.S., Canada, Mexico, and Germany, have higher adoption rates. The automotive switch market has witnessed button-based products gain prominence in passenger and commercial vehicles due to their increased installations for electronic systems. Manufacturers are focusing toward the incorporation of touch pads in China and India to expand their reach. The significant China automotive switch market size has led to considerable demand in Asia Pacific. APAC has witnessed about 20% automobile production growth from 2012 to 2016, supported by China, India, Japan, and South Korea. Increased number of passenger and commercial vehicles has raised the demand for technologically advanced components to be incorporated into vehicles. The U.S. vehicle production has grown about 18% from 2012 to 2016. Increasing luxury vehicle demand will lead to more installations per vehicle. The presence of established automobile manufacturers, such as Ford, Tesla, General Motors, and Chrysler, is providing easy availability of credit facilities to prospective buyers, which will increase the automobile demand across the region. 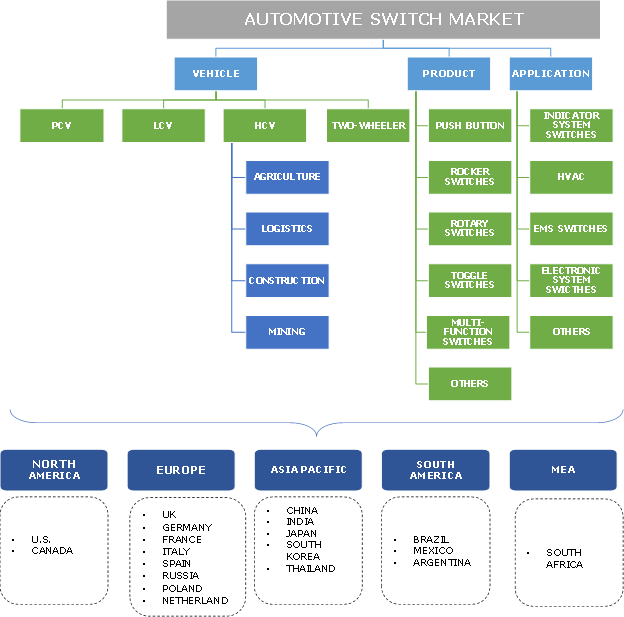 Delphi, Continental, Omron, Tokai Rika, Hella and ZF TRW are some of the major automotive switch market suppliers. Switch failure is the biggest threat to the automotive industry as it is responsible for activating/deactivating a function or safety command. For instance, General Motors recalled 5.8 million vehicles in 2014 for an ignition switch defect. This recall affected Grand Am, Malibu, Alero, and other cars. 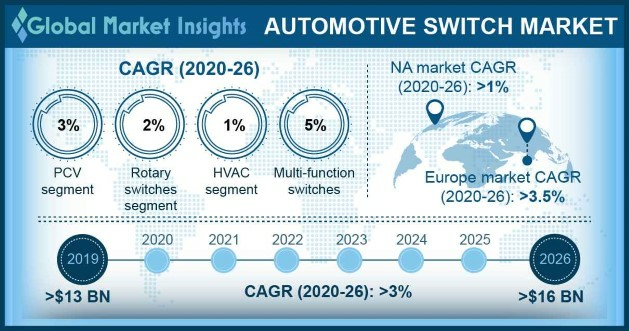 The automotive switch market is characterized by regional expansion to meet the production demand and new product development to achieve fail-safe components for incorporation into automobiles. Automotive switches are electromechanical devices, which are used to operate an electrical circuit. Toggle, keypad, push and pull, and marine grade are different types of electronic components. These can be classified into water resistant and non-water resistant. They help drivers to control the direction indicators, windows, headlights, and infotainment. They can also be used as ignition switches to start or stop the engine. They are used for numerous applications in automobiles some of which include indicator system, heating, ventilation & air control, and engine management. Depending on the intervention, automatic and manual components are used in passenger cars, light commercial vehicles, and heavy commercial vehicles. Automotive switch market suppliers are required to manufacture components meeting the design specifications and the requirements as stated by various regulatory bodies and international associations. Many OEMs are adopting backward integration for increasing in-house production to gain control over costs.